Hello! I am on a intermittent fasting, and i have to workout at 8am in the morning, while i am still fasting, may i take a fatburn because it include caffeine inside before workout? I use dyma-burn extreme. Depends, but most fat burners don’t have enough caffiene for you to feel the effects before your workout. Interesting article because I tried a pre-workout drink for my kung fu class last week. It was called somethingh like NO3ZCG9, contains caffeine and it worked great. It was a 3 hour kung fu session and I was focused the whole time and breezed through it. The downside, and I am not sure whether it was the caffeine, but I have been wasted for about three days after using it. Maybe I was overtraining but funny coincidence after using this that I felt completely fatigued. I am going to use it again next monday and see if I get the same after-effects. If so I am probably better off not using it. Damn 3 days? That’s pretty crazy. Good article. I’ve tried a lot of supplements over the years and basically narrowed it down to caffeine and beta alanine. I also take a multi-vitamin, fish oil and whey/casein protein. Have you tried this one yet? 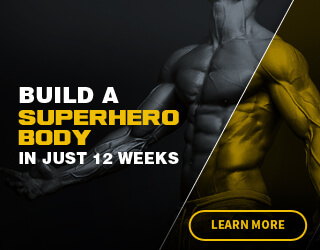 http://www.prejym.com I’m thinking about trying it, but I’m sick of throwing money away on the latest, greatest supplement. I would work out everyday and be really sore the next morning when I woke up. Since I have been taking Dr Max Powers Anabolic Stack I have been waking up refreshed and ready to hit it again. The Dr Max Powers Stack gives me a lot of energy and that extra little push in the gym. I have been taking 1 packet per day and it has been going great. I plan to increase scoops next week to see what happens, Im anxious!! I was taking a pre workout supplement called Amplified Muscle Igniter 4x. It was a GNC product. It contained 400 mg of caffeine and is in pill form. Been taking it for years. Now I’m struggling really bad to find a replacement. I need 400 mgs, so I’m very tolerant to the most amount of caffeine in pills. They were discontinued because some people had bad reactions to it. I never had bad reactions to it. But anyways, since I’m tolerant to 400 mg of caffeine, could the caffeine pills still cause an after workout crash to me? I don’t know how you will react. You can try it out. All I remember is when I take more than 300 mg, I want to throw up haha. I bought the Dr Max Powers Anabolic Stack – just took my first packet today before the gym – It kicked in quickly. I’d say it took about fifteen minutes. I got amazing pumps, my veins looked swollen. The energy level was spectacular, and most of all I felt relentless. My body actually went out of commission before my energy and motivation did. I left the gym wanting to do more, but knowing my body couldn’t. I would highly suggest this supplement as a must have in your stack. I completely agree with this article. I have been using caffeine pills since 2010, after dropping Jack3d from my supplements. I had come to the same conclusion you had – most modern pre-workouts are loaded with fillers and piggyback chemicals. Great article. Thank you for spreading some awareness. Thanks for this article. I was glad to know more people are coming to the realization that lots of pre-workout and indeed, quite a few of fitness products are not what they are hyped out to be. Yes, caffeine has its merits – but as a health professional, I can say it affects your health at high doses. How about Matcha tea? Does the job well. No fillers, side-effects and chemicals!! never tried, if u like it and it works, then go for it. True stuff. I only recently got interested in fitness but I’ve been taking caffeine pills to get an energy boost in the morning for a year now, since tea doesn’t cut it for me and I dislike coffee. And oh boy, it does its job perfectly, unlike the hundreds of snacks marketed as energy givers, and it’s got no known negative effects on your health (and zero calories!) unlike the sugary energy drinks. I can wholeheartedly recommend caffeine pills at any time anyone needs energy, stop buying the expensive energy drinks and pointless candy bars.